If you have any kind of clothing store - formalwear, babies, womens, mens, childrens, teens, etc., we want to talk to you! We have proven results getting websites to the top of the search engine by optimizing for relevant keywords that are specifically related to YOUR website. The two examples, shown below, are optimized for formalwear, as well as, menswear, and tuxedos in Iowa. They are both good examples of high-ranking websites in the menswear and formalwear clothing industry. 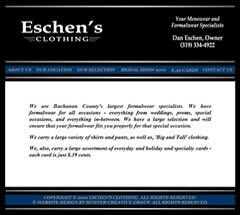 Eschen's Clothing Store - This clothing store is located in Independence, Iowa. They are Buchanan County's largest formalwear specialists and have tuxedo rentals for all occasions - everything from weddings, proms, special occasions, and everything in-between. We have a large selection of menswear and will ensure that your formalwear fits you properly for any special occasion. 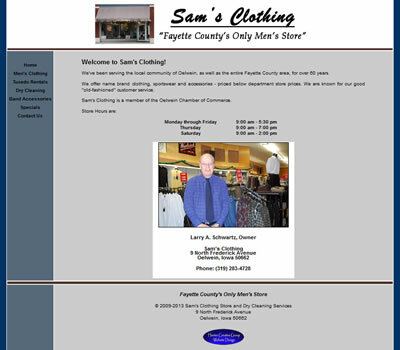 Sam's Clothing - This menswear and formalwear clothing store is Fayette County's only men's clothing store and they are located in Oelwein, Iowa. Sam's offers name brand clothing, sportswear and accessories - priced below department store prices. We also provide dry-cleaning services. If you already have a website or have just been thinking about getting a website to get your business online, we will help market your clothing stores online so that you gain a higher visibility and get your website in front of your targeted market. Take a chance on us and let us prove how much more successful your business can be with the right website! In today's world wide web, there are now millions of websites online so it's simply not 'good enough' to have just any freebie website available - they WILL NOT help you get the targeted people you want and you may be losing many potential customers each day! It's extremely important to get your website listed in the top few pages or you may never get found by your target market! It can take up to 9-12 months for the full effects of any website design with optimization techniques implemented to be seen. However, faster results are typically seen by our clients (some only take a few weeks before noticeable results are seen). In the cases of Eschen's Clothing Store and Sam's Clothing, it hasn't taken either of these formalwear clothing store websites very long to climb this high in the organic search engines rankings. Sam's Clothing store has only been optimized for keywords just recently and it is already proving to be a top-ranking website. In fact, if you are reading this page, it is because you probably came across it in the top pages in your search for a website with Formalwear, Tuxedo Rentals, Iowa Tuxedos, or Menswear Clothing Stores in Iowa. Be aware that if any web design business promises they will get you to be #1 in the search engine rankings, run the other way ... Absolutely No business can guarantee top rankings (for ANY website) ... ONLY Google can guarantee your placement in the search engine results. However, also - be aware, that there ARE things that can be done in order to help your website get higher placement rankings in the search results. Contact Hunter Creative Group to see what we can do for you! We are Formalwear and Other Clothing Stores Website Designers and Developers in Iowa Specializing in High Online Visibility for Formalwear, Menswear, and Clothing-Related Websites.